Description: Durable, double-wall stainless steel vacuum construction with copper insulation, which allows your beverage to stay cold for 48 hours and hot for at least 12 hours. 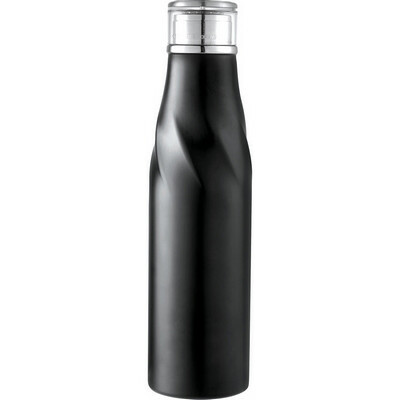 Features: Design features auto-sealing method for easy opening and a more comfortable drinking experience. Wide opening for comfortable filling and pouring. Hugo has a auto-seal and spill resistant lid with a capacity of 650ml. Lid is BPA Free. Packaging: Polybag Colour: Black Material: 18/8 GradeStainlessSteel Product Size: 280mm(h) x 74mm ? Freight details : 24 per carton, 9.7kgs, 47.5 x 32 x 30cms; Decoration Type(s): Colour Print / Full Colour Print / Laser Engrave Decoration Area: Print: Varies depending on print method; Laser: 35mm(w) x 45mm(h) or 20mm(w) x 80mm(h). Price includes : 1 Colour 1 Position Print. Setup is included.